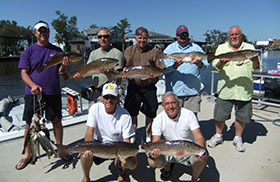 October is here and the speckled trout are starting to show up right on time on the north side of Barataria Bay. 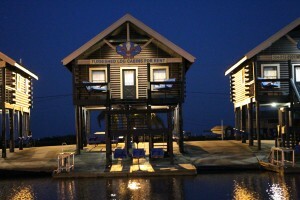 This weekend we had a full house here at Bayou Log Cabins Fishing Lodge. We had a group in from little rock Arkansas as well as a group in from Baton Rouge Louisiana. 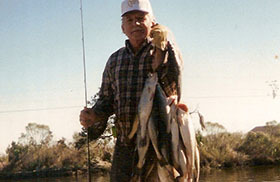 Everybody had on their check list to catch fish and it didn’t matter if it was speckled trout or red fish. I would like to start off this morning by talking a little bit about the weather. Every year is different regarding the time of the year that the fall air arrives. This year it looks like it is a little late as we are getting the first cool front today around the middle of October. The speckled trout already knew the fall season was coming because the fish we been catching has no more eggs in their sacks. We just needed a little cool weather to cool the water down a little bit so they can start their migration in from the barrier islands towards the shallow lakes and dead-end pipe line canals. The fish are moving in right now because I had a trip this weekend and had to go out to Grand Isle to pick up my customers. I wanted to check the oyster reefs near the barrier islands where we been catching speckled trout all summer to see if they might be delaying their migration inland. We did not get a bite out by the barrier islands so that confirms that the transition has started and they are on their way in. Anyhow after trying a few spots out near the beach we headed in to the shallow lakes and dead-end pipe line canals and started catching some nice trout. They were a little on the small side by were keepers and they had a wonderful time boxing up their limit. We had two little girls on the boat that must have been around eight years old and I can tell you that they knew how to throw a fishing pole better than a lot of men that get on my boat. We were fishing with live shrimp and you should have seen those little girls reaching in the live shrimp bucket to get the next shrimp for me to bait their line. They were not scared to grab that shrimp at all. In fact, by the end of the trip they didn’t want me even baiting their line, they wanted to do everything. They would bait their line, throw it out, set the hook and net the fish when it got on the side of the boat. I was amazed at how acclimated they were with just four hours on the boat. Like I said we caught a box of speckled trout and then headed inland to some duck ponds and shallow broken marsh to fish for some red fish. By the time we were finish with catching the specks everybody knew the drill regarding how the boat worked. We pulled up in a red fish honey hole that I know of and it was on. They were working the boat like they had been on it many times before. 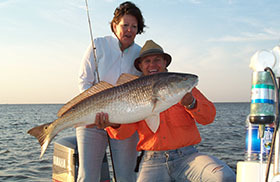 If the mom or dad would hook into a nice red the girls would put their pole down and grab the net to land the red fish. If one of the little girls would set the hook on one then the mom or dad would have the net ready to net the fish. Lots of photos were taken during the trip but most of all lots of memories were built during the trip. You hear me talk about building memories all the time when I am writing about these fishing trips. The fishing trip only last for about four to five hours, however the memories you will build while on the water will last a life time with your family. I know without a doubt that those two little girls will never forget the time we had catching those fish. They will talk about that fishing trip to their friends and family for the rest of their lives. To me that is more important than catching all the fish in the world. If the people on my boat have an enjoyable time and build memories while on the water my objective is met. Catching fish will happen most of the time, but making the atmosphere pleasant so that everyone is having a wonderful time is what my job is as a captain. 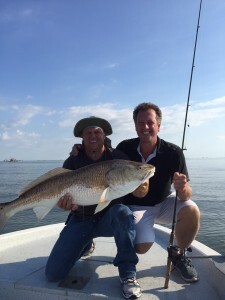 After catching the specks and reds we headed back to Grand Isle to drop them off at their pick-up point. It was a lot of running for me but sometimes that is what I must do to meet the needs of my customers. I didn’t have to clean any fish because they were set up at the condo to take care of all the post fishing duties. 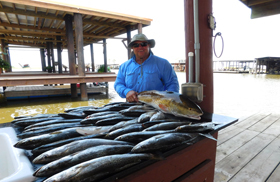 While they were cleaning the fish, I was traveling back across Barataria Bay to get back to the fishing lodge. Now that we are getting this cool front, I feel positive that the larger females are going to start showing up close to the fishing lodge. This is a thing that happens every year once the water temperature reaching a certain point. A lot of the shrimp and other bait feed will leave for the winter and the food will get scarce, so for the next few months we will be swapping over the fishing with artificial bait. This kind of fishing is much easier on me regarding catching the live shrimp, baiting the lines as well as many other things that goes along with using live shrimp for bait. 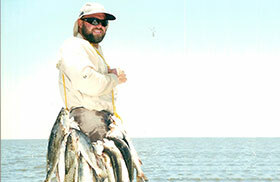 This is what I call the easiest time of the year to fish for speckled trout. 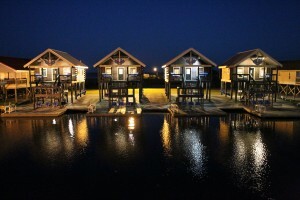 Just thirty five miles south of New Orleans Louisiana Bayou Log Cabins Fishing Lodge has some of the best speckled trout and red fish fishing in all of north America.